Portslade makes up the areas of Foredown and Mile Oak. Foredown Hill and Mount Zion lie between Mile Oak and Benfield Hill in the South Downs National Park which extends in to the city including the fields around the now closed Foredown Tower. There is a walking guide from Foredown to Devil's Dyke called Hove Downland (PDF 1MB). 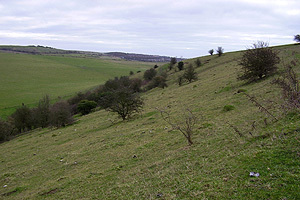 The eastern slopes of Mount Zion, also known as Foredown Ridge Site of Nature Conservation Importance (SNCI), are important chalk downland habitats. There is also a dew pond adjacent to the bridleway along the ridge. 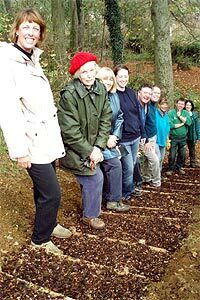 A “missing link” bridleway (including cycle access) at Perching, north of Mile Oak, in West Sussex has been secured by Natural England as part of a 10 year farm Higher Level Stewardship agreement with the landowner from January 2010. The route connects with a bridleway to the south to provide a useful link for walkers and riders between the city and the South Downs Way - see Natural England map. This is a working farm so please do not disturb the livestock or the wildlife, shut the gates and keep all dogs under close control. Three Cornered Copse is a 1km strip of green space between Woodland Avenue and Woodland Drive from Dyke Road Avenue down to Goldstone Crescent. The site has a range of habitats, including scrub, a hedgerow and woodland. It provides a `green link' between Hove Park and Green Ridge. Three Cornered Copse is a popular site for quiet recreation. The area north of Hangleton and West Blatchington, in the South Downs National Park, is centred on the golf course at Round Hill with a burial mound near the top. Devil's Dyke is to the north, Benfield Hill to the west and Waterhall to the east. There is a large Site of Nature Conservation Interest with ancient, species-rich chalk grassland. Notable species recorded include Cowslip, Carline Thistle, Chalk Milkwort, Fragrant Orchid and Adonis Blue butterfly. There are also areas of scrub, a dew pond and a prehistoric coaching road. Most of the SNCI is within the private golf course and adjacent farmland. The disused railway to Devil's Dyke passes around the west of Round Hill and is now a popular cycle path. The Monarch's Way follows the 615 mile route taken by King Charles II after the Battle of Worcester in 1651 as he made his escape from Cromwell's Parliamentary forces via Shoreham to France. The route to Shoreham circumnavigates Hove from Southwick Hill via Benfield Hill, West Blatchington, Hove Park, the Royal Pavilion and then west along the seafront.